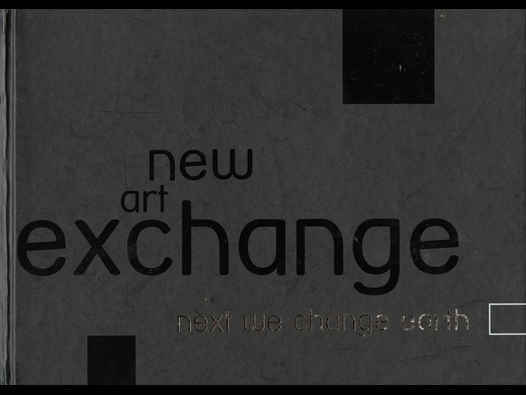 Lavish and substantial catalogue, sized and shaped, A4 landscape, for Next We Change Earth, the inaugural exhibition of New Art Exchange, a new visual arts space that opened in Hyson Green, Nottingham in the autumn of 2008. The exhibition was curated by David Schischka Thomas and Michael Forbes. The dates of the exhibition were 6 September - 26 October 2008 and the exhibition included work by Forbes himself, plus Said Adrus, Elshaday Berhane, Dubmorphology with Gary Stewart, Trevor Matghison/Obinna Nwosu, Samson Kambalu, Harjeet Kaur, Hetain Patel, Keith Piper, Narir Tambouli, and Andrew Wright. The title of the exhibition came from a work by Kambalu in which he created anagrams of the words The New Art Exchange. The exhibition featured artists all of whom had connections to the city of Nottingham. From the curators’ foreword: “I first came up with the concept of Next We Change earth, whilst researching a period in the history of Nottingham and its relationship with artists like Keith Piper, Donald Rodney and Said Adrus. These pioneering artists are important historical figures within the British ‘Black Arts movement’. (David Schischka Thomas). “I do not want to get lost in concepts and academic theories about the work in the exhibition, for me when selecting artists for any show my main criteria is the quality, aesthetic and emotional effect of the work in a gallery space.” (Michael Forbes). As mentioned, the catalogue was extensively illustrated, including before and after photographs of the site and New Art Exchange building.